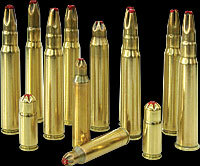 Blanks- We can make blanks for most any rifle cartridge. Often used in ceremonies and just for fun. Please know that we do not stock these cartridges and the delivery time maybe quite slow. Generally blanks WILL NOT cycle a semi or full auto firearm.NOT AVAILABLE AT THIS TIME! Dummy Rounds- We can make any rifle round as a dummy round. It will include a highly polished cartridge case without a primer and generally a hole drilled in the side and a bullet. We can link them for training purposes too. Dummy rounds are most often used for training. You can even have your name or company logo put on the side. Special ammunition- We can make a special round with your wildest ideas. Call us with your idea. We have made loaded ammunition with person’s ashes inside for memorial ceremonies. Your Favorite Load- We will make your favorite load for you. See our information under the "Your Favorite Load"(click) menu heading.